The Morning Glory’s atmosphere speaks to the kind of food it serves. The building was originally a house, and it retains its screened-in porch, but the walls have been painted with cheery murals of plants and fields. Coffee is served in mismatched mugs, and jars of marionberry preserves are available at every table. The food – excellently made breakfast favorites served in huge portions – matches the charm of the decor, making a stop at the Morning Glory mandatory for any Ashland tourist. The breakfast menu is essentially divided into two parts: Egg dishes and pancake variants. The egg dishes also come with a number of sides, such as crisp hash browns and light, airy muffins; if you prefer breakfasts made up of many small components, ordering off the egg side of the menu might work better for you. 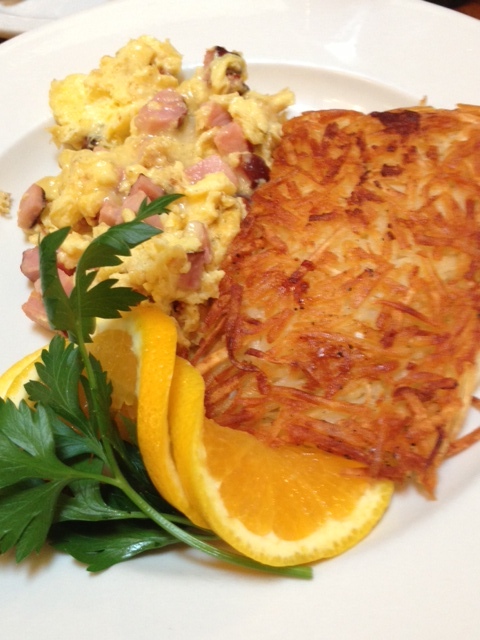 One of the best egg dishes is the black forest ham and white cheddar scramble ($12/$10 for a half portion), which accents the classic American flavors of ham and eggs with a sharper variety of cheese. Although the egg dishes and sides are delicious, it’s difficult to beat the impression made by the Morning Glory’s pancakes, waffles, and French toast when they’re brought to the table. Most astonishing of all is the lemon ricotta stuffed French toast with raspberry syrup ($11.50), two giant slices of French toast with a thick cheese filling. Tangy syrup poured on top helps cut the richness of the ricotta while accentuating the flavor with the taste of raspberry. Other items to choose from include the filling oatmeal pancakes with walnut butter ($11) and the Belgian waffle ($10.50), an American breakfast standard served with lemon butter. A set breakfast menu isn’t the only thing the Morning Glory has to offer. A smaller lunch menu offers burgers and sandwiches, while brunch-style alcoholic libations like mimosas and Bloody Marys are available all day. There is also a rotating series of specials, displayed at the chalkboard close to the entrance: If something there interests you, it’s a good idea to order it while you can. Many people who make a habit out of going to Ashland each year for vacation make sure to stop at the Morning Glory at least once. Should you choose to experience the incredible food, quirky environment, and relaxing atmosphere of the restaurant for yourself, the Morning Glory is very likely to become your tradition, as well.